Many family memories came flooding back as I canned peaches today. 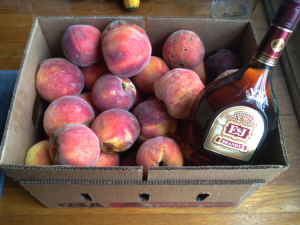 Yesterday, I bought a huge box of Blades Orchard peach seconds for $18 from at the farmer’s market, with the intention of making brandied peaches last night. But I ended up working all day and ran out of steam that evening while I unpacked jars, the pressure canner and other equipment I’d need for the project. I decided to wait until today. It wasn’t until this morning that I realized what day it was. My Aunt Teri’s birthday. She was the inspiration for making the brandied peaches in the first place — she was famous for them. They were coveted gifts and a beloved side at family holiday meals. After eating the peaches, we often used the leftover juice in the jars for making bellinis. But the world has been without Teri’s brandied peaches since she died two years ago. I still miss her (and her brandied peaches) terribly. It’s been a while since I participated in Saturday Night Genealogy Fun (or blogged at all, for that matter). I happened upon this week’s SNGF assignment from Randy Seaver and was inspired to write a post though! 1) It’s the first day of Summer 2014, so let’s talk about what we did as children (not teenagers or young adults) on our summer vacations from school. 2) Write about your life as a child in the summertime (say, any age between 5 and 12). Where did you live, what did you do, how did it influence the rest of your life? I have such fond memories of the first house my family lived in, which was in the Woodmoor neighborhood (aka Four Corners) in Silver Spring, Md. Summer days were spent almost entirely outside there. I remember having to go to bed before it was dark when I was really little, but not before watching Family Feud with my parents in the den. My mom would often let me have an After Eight or Andes mint as a special treat while we watched TV. I loved sleeping with the window open in my room, listening to the crickets and watching for lightning bugs. My backyard had the swing set, making it the destination for all kids on my block. My friend Lauren lived across the street and we’d often be found hanging out on the swings, coloring on the back patio or sneaking pieces of bubblegum behind my mom’s car in the driveway. Around the time I was 7 or 8, my summer morning chore was to scoop Miracle-Gro into a big watering can and water the roses along the fence in the front yard. My sister and I had to accompany Mom on trips to the grocery store during the summer. The most exciting grocery store trip was in prep for our annual trip to the beach — we’d get to pick out those mini boxes of sugared cereal (the only time of the year we were allowed to eat it), sodas (ditto) and other snacks. We’d usually be back from the store in time for lunch — PB&Js with chocolate milk. I remember watching lots of the TV show Reading Rainbow, which then inspired trips to the library. I was a voracious reader from an early age. When I was a bit older, my mom trusted me to walk around the corner with Lauren and an older neighbor, Joelle. We’d follow a creek that cut through the neighborhood to a larger stream (all a part of the Rock Creek network of waterways). We’d search for crawfish and minnows, climb rocks, avoid snakes and find cool in the shade of the trees along the water. I’d also walk up to Woodmoor Shopping Center armed with a couple dollars and our family’s video rental card to pick up a movie or two for my sister and I to watch, along with some candy from the drug store. I always made sure to window shop at the Woodmoor Pastry Shop (they still have the best cookies and cupcakes). On summer nights, Joelle’s family often hosted the neighbors for bbqs in their backyard. I remember my first toasted marshmallow, burnt to a crisp over their grill. Then we’d gather in my family room to watch scary movies (Jaws and Gremlins come to mind). My grandma, aunts and cousins would come over for bbqs in our yard too (and we’d visit them). I grew up on charcoal-grilled chicken, burgers and dogs all summer long. I still prefer that smell and flavor when grilling. On really special occasions, my mom would make creme de menthe brownies for dessert. 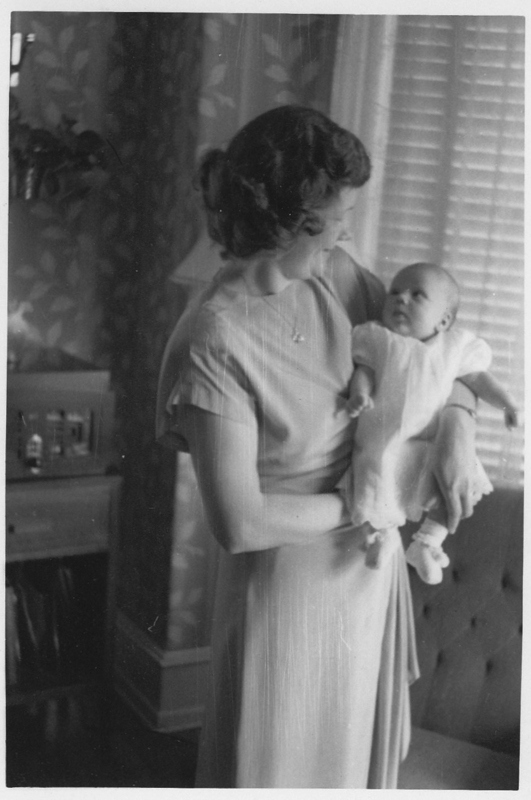 Mother’s Day is tomorrow and I thought I would post some unpublished photos of my Grandma Grace, which I count among my favorites of her. 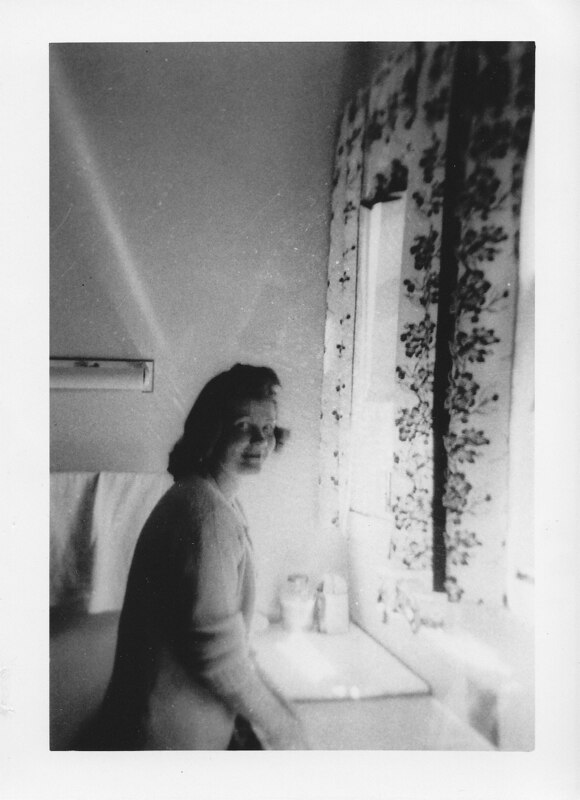 The earliest photo of my Grandma Grace that I am aware of. 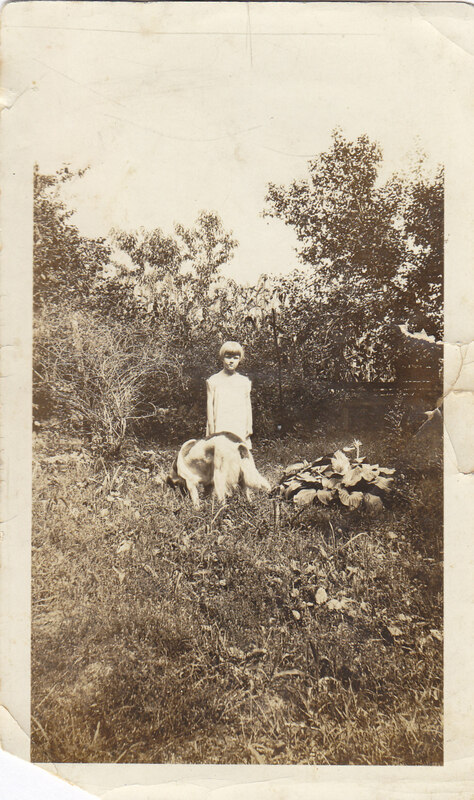 This would have been taken on the family farm in Elizabethton, Tennessee. 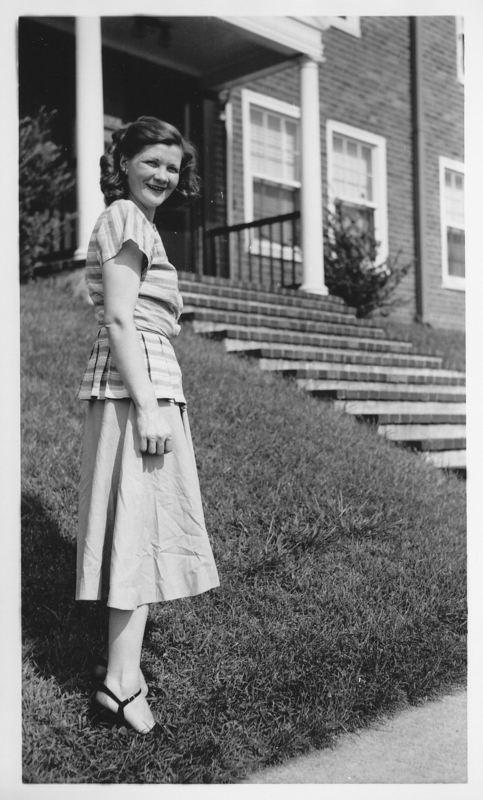 I love this photo of Grandma Grace. I wish I knew where this was taken. Might a New Clue = A Chink in a Brick Wall? I had a breakthrough on one of my lines over the weekend. I found a passport application for my paternal great-grandmother Ida Champ Ferris, which listed her birthplace as Brownsville, Penn. (Her name was mis-indexed, which is why I’d never come across it before.) I had always thought that she was from the Philly area because that’s where she went to college, but turns out that she was born closer to Pittsburgh. I don’t know much more about her parents except that they came from England shortly before she was born. Hopefully this new information will lead to more clues about them!